Camp Punk In Drublic festival producers have announced that NOFX and Me First And The Gimme Gimmes (featuring Fat Mike) will not be performing at this weekend’s festival at Legend Valley near Columbus, OH. Descendents have been added to the Saturday festival lineup, replacing NOFX, and The Vandals have been added to the Friday Night Kickoff Party, replacing Me First and the Gimme Gimmes. While NOFX is known for their dark, uncomfortable humor, the festival producers of Camp Punk In Drublic are shocked and disappointed by the band’s recent statements about the Route 91 Harvest Festival victims and country music fans. These statements do not reflect the feelings or views of the Camp Punk In Drublic festival, its staff, and its sponsors. The festival producers support fans of all music genres and take safety very seriously at all of their events. Out of respect for Route 91 Harvest Festival victims and their families, Camp Punk In Drublic will make a donation to a fund benefitting those affected by the 2017 tragedy. 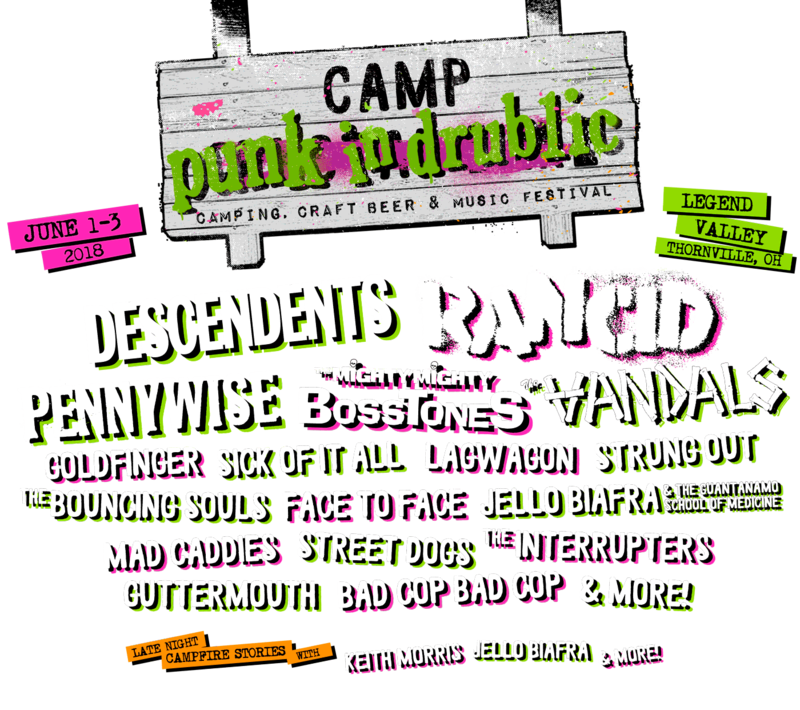 As the only punk rock campout in the country, Camp Punk In Drublic will feature performances by Rancid, Descendents, Pennywise, The Mighty Mighty Bosstones, The Vandals, and more, along with a weekend of craft beer tastings (available for purchase), campfire stories from punk legends, and various attractions. The festival takes place Friday, June 1 (Friday Kickoff Party), Saturday, June 2, and Sunday, June 3 at Legend Valley in Thornville, OH. Visit www.PunkInDrublicFest.com/Camp for details on Camp Punk In Drublic. Brutal Assault 21 – WIN FREE 2016 FESTIVAL PASS! Rock im Park is sold out!